Data from NASA's Cassini spacecraft show that the variation in radio waves controlled by the planet's rotation is different in the northern and southern hemispheres. Moreover, the northern and southern rotational variations also appear to change with the Saturnian seasons, and the hemispheres have actually swapped rates. "The rain of electrons into the atmosphere that produces the auroras also produces the radio emissions and affects the magnetic field, so scientists think that all these variations we see are related to the sun's changing influence on the planet," said Stanley Cowley, co-investigator on Cassini's magnetometer instrument. "These data just go to show how weird Saturn is," said Don Gurnett, Cassini's radio and plasma wave science instrument team leader, and professor of physics at the University of Iowa, Iowa City. "We thought we understood these radio wave patterns at gas giants, since Jupiter was so straightforward. Without Cassini's long stay, scientists wouldn't have understood that the radio emissions from Saturn are so different." Saturn emits radio waves known as Saturn Kilometric Radiation, or SKR for short that sound like bursts of a spinning air raid siren, since the radio waves vary with each rotation of the planet. This kind of radio wave pattern had been previously used at Jupiter to measure the planet's rotation rate, but at Saturn, as is the case with teenagers, the situation turned out to be much more complicated. A new paper led by Gurnett that was published in Geophysical Research Letters in December 2010 shows that, in recent Cassini data, the southern and northern SKR periods crossed over around March 2010, about seven months after equinox, when the sun shines directly over a planet's equator. The southern SKR period decreased from about 10.8 hours on Jan. 1, 2008 and crossed with the northern SKR period around March 1, 2010, at around 10.67 hours. The northern period increased from about 10.58 hours to that convergence point. Seeing this kind of crossover led the Cassini scientists to go back into data from previous Saturnian visits. With a new eye, they saw that NASA's Voyager data taken in 1980, about a year after Saturn's 1979 equinox, showed different warbles from Saturn's northern and southern poles. They also saw a similar kind of effect in the Ulysses radio data between 1993 and 2000. 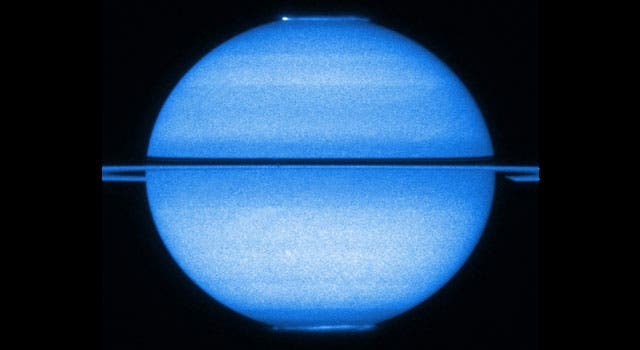 The northern and southern periods detected by Ulysses converged and crossed over around August 1996, about nine months after the previous Saturnian equinox. Cassini scientists don't think the differences in the radio wave periods had to do with hemispheres actually rotating at different rates, but more likely came from variations in high-altitude winds in the northern and southern hemispheres. Two other papers involving Cassini investigators were published in December, with results complementary to the radio and plasma wave science instrument – one by Jon Nichols, University of Leicester, and the other led by David Andrews, also of University of Leicester. In the Nichols paper, data from the NASA/ESA Hubble Space Telescope showed the northern and southern auroras on Saturn wobbled back and forth in latitude in a pattern matching the radio wave variations, from January to March 2009, just before equinox. The radio signal and aurora data are complementary because they are both related to the behavior of the magnetic bubble around Saturn, known as the magnetosphere. The paper by Andrews, a Cassini magnetometer team associate, showed that from mid-2004 to mid-2009, Saturn's magnetic field over the two poles wobbled at the same separate periods as the radio waves and the aurora. As the sun continues to climb towards the north pole of Saturn, Gurnett's group has continued to see the crossover trend in radio signals through Jan.1, 2011. The period of the southern radio signals continued to decrease to about 10.54 hours, while the period of the northern radio signals increased to 10.71 hours. "These papers are important in helping to explain the complicated dance between the sun and Saturn's magnetic bubble, something normally invisible to the human eye and imperceptible to the human ear," said Marcia Burton, a Cassini fields and particles scientist at NASA's Jet Propulsion Laboratory. The image top of page: NASA/ESA's Hubble Space Telescope from early 2009 features Saturn with the rings edge-on and both poles in view, offering a stunning double view of its fluttering auroras. credit: NASA/ESA/STScI/University of Leicester. Image credit: NASA/ESA/STScI/University of Leicester.